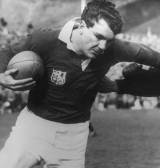 O'Reilly made his Test debut for Ireland against France in 1955 as a teenager, and was well received by the press despite Ireland's narrow defeat. He played 26 times in the Five Nations up to 1963 and was recalled, out of the blue, to make a 27th appearance in the tournament as an eleventh-hour stand-in against England at Twickenham in 1970. His selection, incidentally, deprived Brian O'Driscoll's father Frank, the nominated threequarter substitute, of his Irish cap. In the colours of the Lions O'Reilly also excelled, winning 10 Test caps between 1955 and 1959. He played in all tour Tests of the thrilling drawn series in South Africa in 1955 and won six caps on tour to Australia and New Zealand in 1959. He remains the Lions' leading try-scorer in Tests with 10.